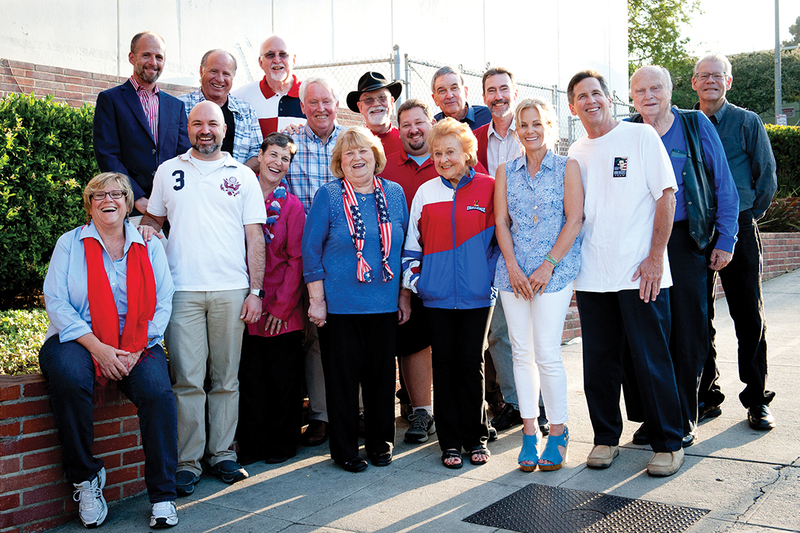 Since 1967, the Palisades Americanism Parade Association (PAPA) has been organizing, financing and overseeing the town’s Fourth of July parade, concert and fireworks. The vital goal of this nonprofit organization is to ensure that the tradition of a parade and fireworks that celebrate Independence Day continues in Pacific Palisades. The all-volunteer group starts planning six months in advance with monthly meetings. All residents and business owners are invited to participate, and new volunteers are constantly sought for this massive fundraising and planning event. PAPA people include (front row, left to right): Joy Daunis, Ramis Sadrieh, Daphne Gronich, Cheryel Kanan, Lee Calvert, Natalie McAdams, Terry Dimich, Ron Hart and Jeff Ridgway. Back row (left to right) Keith Turner, Richard Greenberg, Rich Wilken, Bill Bruns, Bill Prachar, David Sarell, Arnie Wishnick and Andrew Frew. (Not pictured): Sylvia and Jon Boyd, Marge and Bob Gold, Rob Weber, Kevin Niles, Robin Weitz, Joan Sather, Sanjay Bargotra, Bobbie Farberow, Matt Rodman and Kurt Bierschenk. PAPA’s activities are funded entirely through donations by local residents, businesses and civic groups. PAPA receives no funding from government or other sources. This year’s Parade Marshal Ron Weber, a securities litigation partner in the global law firm DLA Piper, joined PAPA in 2004 expressly to help bring more bands to the parade. Not only did he achieve that purpose, he later served as PAPA president for three years. If you have new ideas, please join and work to make this parade even more spectacular. PAPA also presents the evening’s Palisades Rocks the Fourth concert and 20-minute fireworks show at Palisades High. PAPA committee members orchestrate these events, with each person given a particular assignment, ranging from permits, insurance, security and traffic control to marching bands, celebrities, fundraising and the pre-parade VIP luncheon. 3rd VP Rich Wilken (fireworks), 4th VP Scott Wagenseller, secretary Sanjay Bargotra and treasurer Cheryel Kanan. Weber and Ramis Sadrieh (a former PAPA president) serve as advisors, and Pageantry Productions is hired to secure and organize the parade lineup. to help on the Fourth. Sanjay Bargotra needs more volunteers to help with the concert and fireworks. Contact: info@palisadesparade.org. Robin Weitz is in charge of the food and serving at the VIP luncheon and Marge Gold is handling decorations. To make a donation to PAPA, please visit: Palisadesparade.org. PAPA is a 501(c)3 corporation, federal identification number 23-7317255.